There are a jillion posts about overnight oatmeal out there. I tried one I found on Pinterest, but it was 9 ponts on WW and it was really hard to swallow, gloopy is an accurate description. Then my friend Lisa made one that looks way better here, and there is no Greek Yogurt, but there is peanut butter. I haven't tried hers, but it sounds yummy. But here I am, wanting oatmeal, but not wanting a bowl of oatmeal. The truth is, there are a lot of points in it, and I need protein for breakfast because I eat right after my work out. 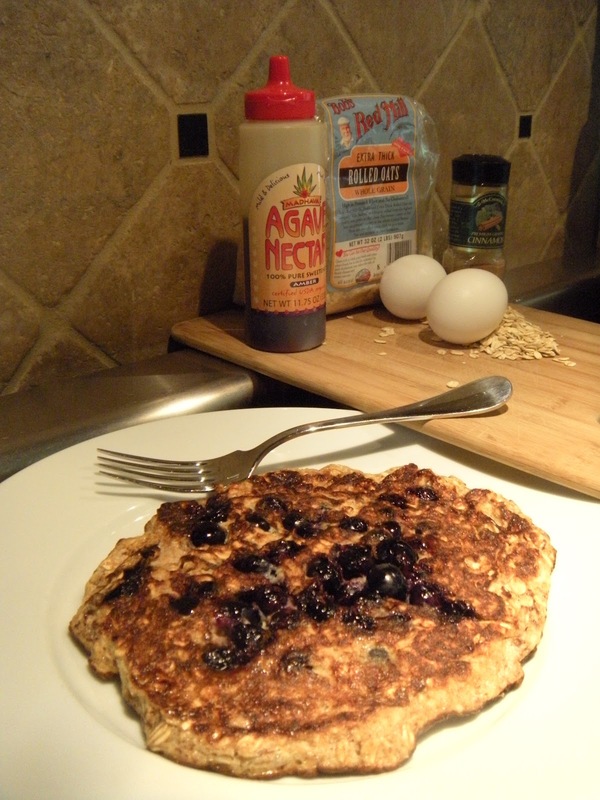 So I thought I would share my Oatmeal Pancake For One! After breakfast, well, actually after lunch, when I woke up the princess, she said, "I thought I smelled pancakes, then I remembered only Mom was home, so, not likely!" Well, wasn't she surprised when I made her one! She has one a few times a week now! 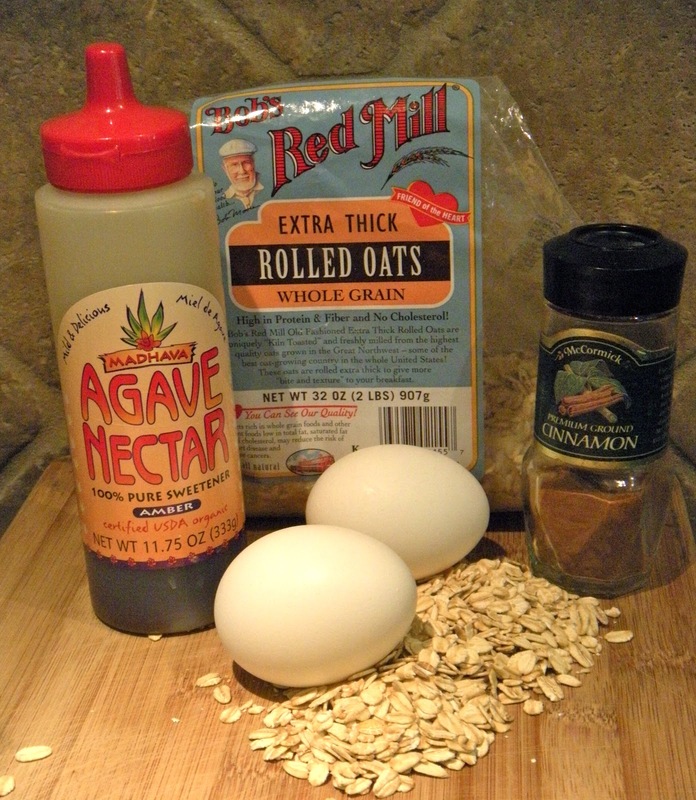 Although I grew up close to a Quaker Oats plant, I have forsaken it for Bob's thick cut oatmeal. I love the chew of this oatmeal. A traditional bowl requires a little more cooking than Quaker, but for making this pancake it is quick and perfect. I do still buy Quaker Old Fashion for my cookies though. I also needed a protein source, so eggs are easy, cheap and low fat. I use a whole and a white, that way, Sookie-the-one-eyed-Bichon gets a healthy little yolk for breakfast! (See her cute little face on this post!) I chose to sweeten with Agave Nectar, but you could use sugar, honey, stevia, whatever. I also had some leftover buttermilk and added a dash. Beat the eggs with a fork and get them foamy, add the oats, cinnamon, nectar, and milk and mix well. Pour into a hot omelet pan and as the edges set, but it is still gooey, sprinkle on your fruit. Carefully flip when the top begins to set, and cook until browned. Depending on the spread, I find the best way to get it out of the pan is to lay your plate over the top, and carefully, flip! So, what are you waiting for! Get in there and cook! Today my daughter's bestie turns 20! Happy Birthday Sara! And in 2 short weeks, my daughter turns 19. As these girls get older that age difference makes less and less of a difference. But way back when we were in kindergarten, it could have been a huge difference. I often wonder, what if? What if I had kept her in preschool another year? Who would her friends have been? What would be different? Thankfully, there are no do-overs, so we can wonder, but thankfully never know if ultimately it was the best choice. She is happy, well adjusted, does fine in school, and yes, she was one of the youngest, but in college, this all makes no difference. We decided on a platter of candles. Small cookies to share with all those girls. I got my inspiration from Maryann of CookieArtisan. It is relatively easy to be inspired by her, she is a true artist and her platters are stunning. She even did an appearance on Martha, yes, she is that good. I love these Americolor Electrics for coloring, and I think these are the perfect birthday platter! Butterfinger goodness in every bite! Mr. Preppy loves Whitey's Ice Cream Butterfinger Malt. This is a hometown favorite, and when we head to Iowa, it is a given that after pizza at Happy Joe's (see one of my most popular posts, ever) we head to Whitey's. I decided for Father's Day I was going to make something we would all like that incorporated Butterfinger Ice Cream, but could be shared. So I whipped up this pie. Let's start with the crust. It had to be home made, but there were no Nabisco Famous Wafers to be found anywhere. I have a real grocery store problem. I was born and raised in the grocery business, and here I am in a major metropolitan city with Kroger. That's it. Oh I have a Fresh Market I love just a minute from home, but you can't get Tide, or Milk Bones or Nabisco Famous Wafers there. As it turns out, the Kroger I chose to shop at yesterday didn't have them either. I dislike Kroger so much. This store is SOOO big, if you don't get a cart, your arm will fall off carrying the basket. I fill it and then ditch it at the head of aisles so I am not lugging it around. So what to do about my crust? I opted to NOT buy a premade crust, as this Kroger doen't even carry the Nabisco or Keebler in chocolate, just the house brand. And the anemic looking chocolate was unappetizing. I made my own wafers a few weeks ago, but I have so much going on, it just wasn't an option. 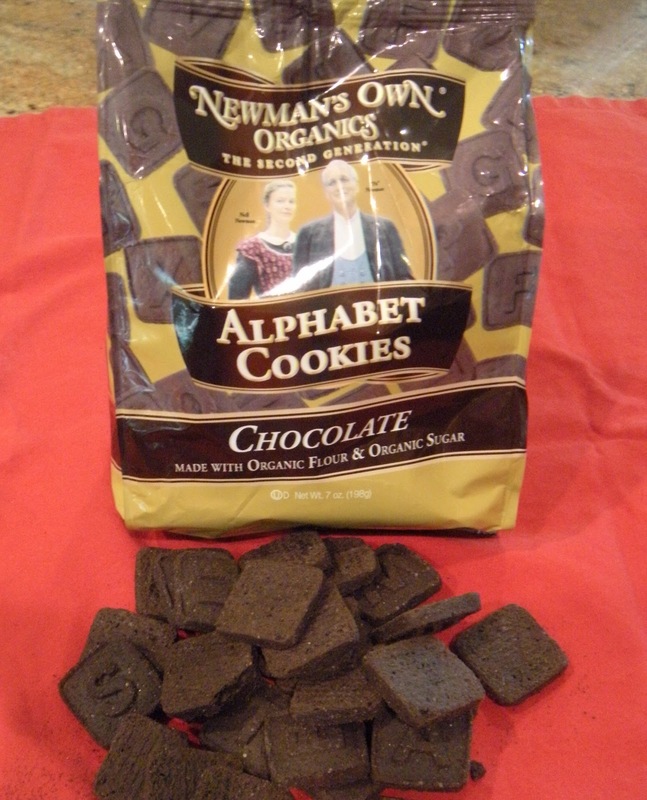 So I settled on Newman's Own Chocolate Cookies. They are little alphabet cookies, and I remember buying them for my kids. They have great chocolate flavor, so I figured it was worth a try. Process cookies in food processor until fine crumbs. Add sugar and pulse. Transfer to bowl and add butter. Mix until it comes together and press into pie dish and up sides. Cover with foil and place in freezer. Then came the ice cream. I am not a fan of custard based ice cream. Finding a recipe I could fool around with was not as easy as it sounds. I ended up with an Alton Brown base. Very simple the way I did it. Heat on stove to 170F, stirring to dissolve sugar. Add vanilla paste off the heat. Let cool slightly and add 1 crushed Butterfinger (fun size), and stir to dissolve as much as you can and infuse that flavor. Cover and chill thoroughly before processing in ice cream freezer. Chill before you beat them for the best results. Place in ice cream freezer, and when the ice cream has almost doubled in size, fold in 5 more crushed fun size Butterfingers and spread the ice cream into prepared crust. Place in the freezer while you make the fudge top. It would be delicious just like this. Does not need ganache! Melt over double boiler and stir until smooth. Cool to room temp before spreading over the top of ice cream pie, and garnish with one crushed Butterfinger fun size. Cover loosely and freeze until ready to serve. This went over very well! It was delicious, no doubt. We decided it doesn't need the chocolate ganache on top, it is almost too much together. The ice cream alone is delicious, and the crust got 8 thumbs up. I think I will skip the Famous Wafers all together and stick to these little cookies! There were demands for seconds, so this did not last long! This blog is about love, golf, the father of my children and Iowa food! My love affair with PGA tournies goes back even before my real love affair. As a teenager in the Quad Cities, we had the Ed McMahon Golf Tournament. My dad was part of the largest grocery chain, so our involvement started way back. In those days a host like Ed McMahon brought in huge celebrities, football players, models, actors and the week of the tourney was filled with parties. Like many tournaments, sponsorship changes over the years, and in 1985 as the Hardee's Golf Classic, I went to the tourney with my mom to watch a little golf and follow these gorgeous guys, like Payne Stewart, Greg Norman, and Jack Nicklaus, big names for a small town. Little did I know fate was at work. My mom and I stood at a green watching a twosome putt in, and this group of guys in plaid shorts and polos, beers in hand, stepped in front of my tiny little mom and me. Well, she let these guys have it, I mean, how rude! And Mr. Preppy, in his madras shorts turns around and says "Hi Mrs. Petitti". "Um, excuse me Mom, how exactly would you know him?" As it turns out, Mr. Preppy worked for General Foods, and his boss was friends of my parents, and they met at one of the golf parties that week. Well, we introduce ourselves to each other, and he kept popping up that day at the course, like he was stalking following me or something. He ended up with my number, and he asked me out immediately, but I was doing a triathlon and couldn't go. I know, yes, a triathlon, me. It was the most epic excuse for not being able to go out on a date. But hey, when I brought home that SILVER MEDAL, I was even more cool. I know, I know, can your disbelief, I was quite the athlete! Our first date was at the driving range. Mr. Preppy was, and still is an amazing golfer, and I was a good student! We then headed off to a local watering hole for Nachos and Alabama Slammers, followed by a midnight swim. At 2 a.m. I called my best friend and my sister and told them, I just kissed the guy I'm gonna marry, goodnight. I just knew, and he did too. It was a whirlwind romance. I still had a year of college left, but I got very good at that one hour drive home. He was working and traveling as well, so sometimes I would magically appear in Peoria, IL or wherever he happened to be working. We got engaged about 6 months later and married a year after that. Three years later, he became a father. And here we are 26 years later, still happy, and still wandering around PGA golf tournies. He's played in a lot of Pro Ams, and we've been to many tournaments. The Masters, Western Open, Doral, FedEx St. Jude and the Ryder Cup. And we have our bucket list, British Open, Phoenix Open (16th hole please), and Pebble Beach (played it, but would like to watch the pros play it!). And one thing is for sure, like ball parks and festivals, every tourney has its signature food. So in honor of my golf partner for life on Father's Day, I am making classic Hardee's Golf Classic grub, and a little Southern twist on the first date food. The food will come in the next post, but here's what we quenched our thirst with on that first date! Mix well and share with your love! Okay, here is the footnote. Nothing ever goes as planned. We opted not to have the BBQ nachos, so I will make this Southern fun another time, it really is a meal in itself, with a beer of course. And I made the tenderloins, but had to use the inferior pork found here. No, really, Fairway Grocery meat department knows how to do a tenderloin, and I pack a cooler when I come home from Iowa with lots of good stuff. So our tenderloins were like a pork chop and not blog worthy. But stay tuned, dessert was amazing! 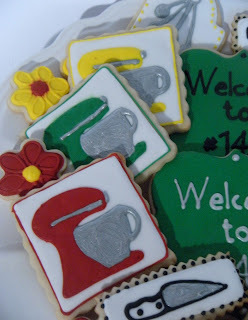 Cookies For My Favorite Store! So if you have read more than one post here, you know I work at the greatest kitchen store of all time. Williams Sonoma. My 15th year....wow. I always smile when I think about Christina, just a little toddler when I started there and now starting her second year of college. Glad I don't age like that! We had some special visitors coming to the store and I offered to make a plate of cookies. I think they turned out pretty good, and sort of sum up the WS life. The ubiquitous Kitchen Aid Mixer, the aprons, the classic spatula, whisk and knife, all things I have sold countless times. I do love my job! 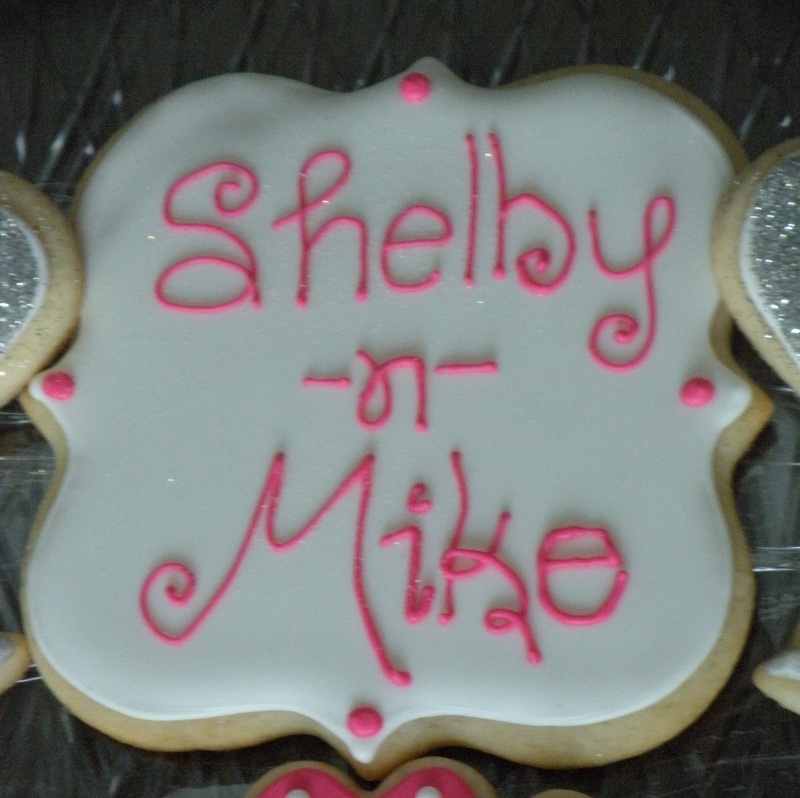 A quick plate to say congrats to the Bride to Be! You know you are getting old when your friend's kids are getting engaged and married. This daughter has been a part of my daughter's volleyball, her younger sister is my daughter's friend, and her mom is one of my favorite people to chat with, especially when we were at a volleyball court. Nothing sparkles like a diamond, except maybe Disco Dust! 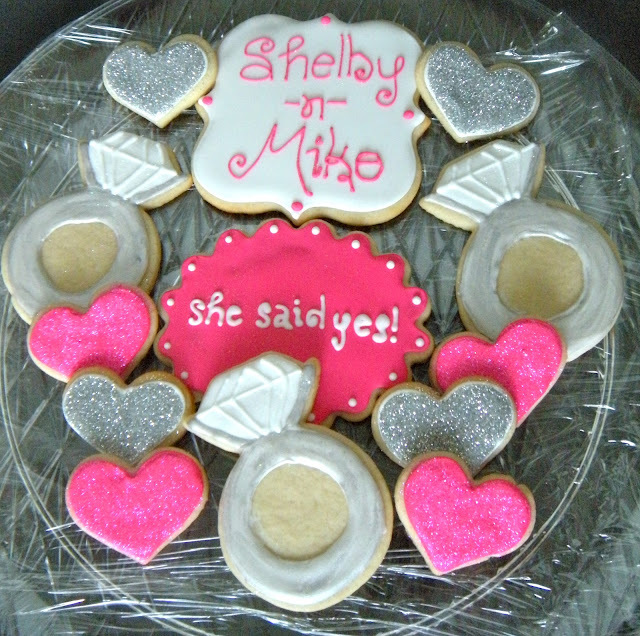 Shelby was engaged on a trip to Mexico while my kids were house sitting for her. I am so happy for her, and her mom and sister are going to have a ball planning a wedding with her! Congrats! 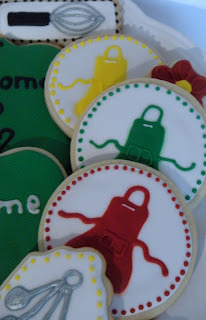 I gave her these cookies at exercise class...there must be some rule about that! Nothing but happiness for you both! It just sounds old fashion, and it is. This is my childhood summer dessert. It reminds me of simple summers, crickets and locusts would be my soundtrack, and there is a breeze blowing off the Mississippi right through the enormous screened in porch where we lived from Memorial Day to Labor Day. You might hear a train every few hours as the tracks were between us and the Mighty Miss, and if you were really lucky, you'd be home when the Delta Queen came by and her calliope organ would signal for you to get to high ground and see her coming past. We had a balcony off my parents bedroom, and from there you could see her, plus the barges that came by all summer. The Delta Queen was truly a glimpse of Mark Twain's river days, and I always thought it would be fun to the see the river from top to bottom. 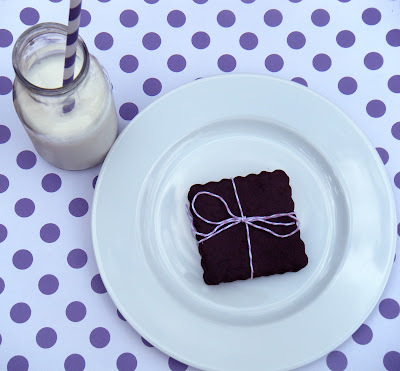 I have blogged about ice box cake before, when I was hunting down Nabisco Famous Wafers and made this cake and some ice cream bon bons. It was requested by my kids early this summer, and when I found a recipe for home made chocolate wafers in my email from King Arthur Flours, I knew I had to make it from scratch. Wow. Of course I used all Pernigotti Cocoa instead of black cocoa and Dutch process cocoa. Also, why do we make round cookies? We make our ice box cake in a 9X9, so I got smart and cut my cookies into squares! And I had a few leftover cookies, so a week later I made a personal size Ice Box Cake for my sweetie. Cream butter and sugar. Add salt, baking powder and espresso powder. Mix well and add egg and vanilla. Add flour and cocoa until all is incorporated. Wrap in plastic wrap and chill a few hours. Why not squares? Use every speck of dough! Preheat oven to 350F. Roll dough to 1/8" and cut out and reroll scraps. Use cocoa instead of flour to keep the dough from sticking. Bake on Silpat lined sheets for about 8-10 minutes, rotating sheets halfway through baking time. Cool on racks and store airtight or frozen. 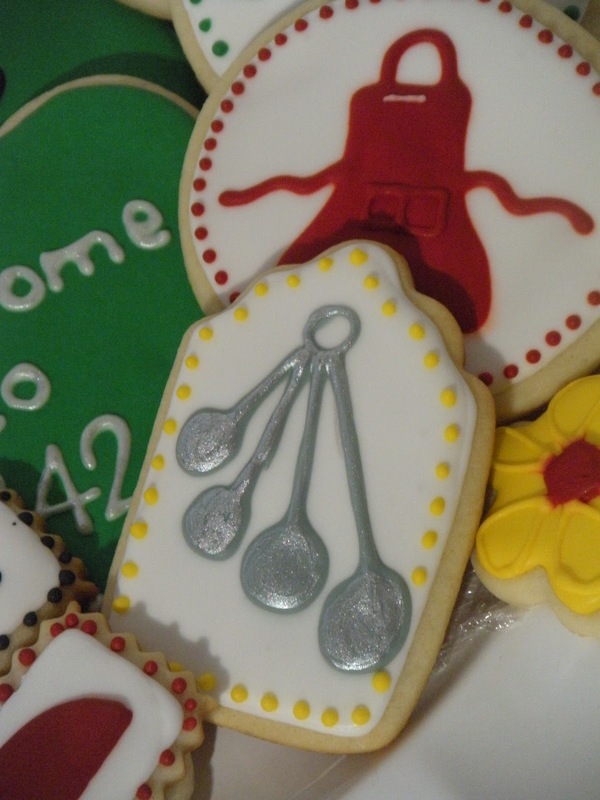 The cookies alone are delicious too! Everything ready to go for assembly. Yes, it's a banana slicer and I use it ALL the time! Beat cream and powdered sugar to stiff peaks. In a 9X9, spread a little whipped cream on the bottom and begin layering. Cookies, bananas, whipped cream, however you like, and quantities you like. We like to crush a few cookies on top of the last layer of whipped cream. Cover with plastic wrap and chill at least 4 hours to soften the wafers. It doesn't cut perfectly, but it is delicious! This is a keeper! Ice cream and cones were easy and tasty! It's that time again! Secret Recipe Club, and this month I was lucky to get the blog, The Slow Roasted Italian. We are both second generation Italians, are at home in the kitchen and love to entertain. Donna would be my perfect neighbor! Browsing her blog was a joy, and when I stumbled on Cannoli Ice Cream, I knew I needn't go any further. Memorial Day was the perfect opportunity to make something cool and delicious as the temps soared to 100 degrees. This was amazing! It is a simple recipe with basically ricotta and milk. 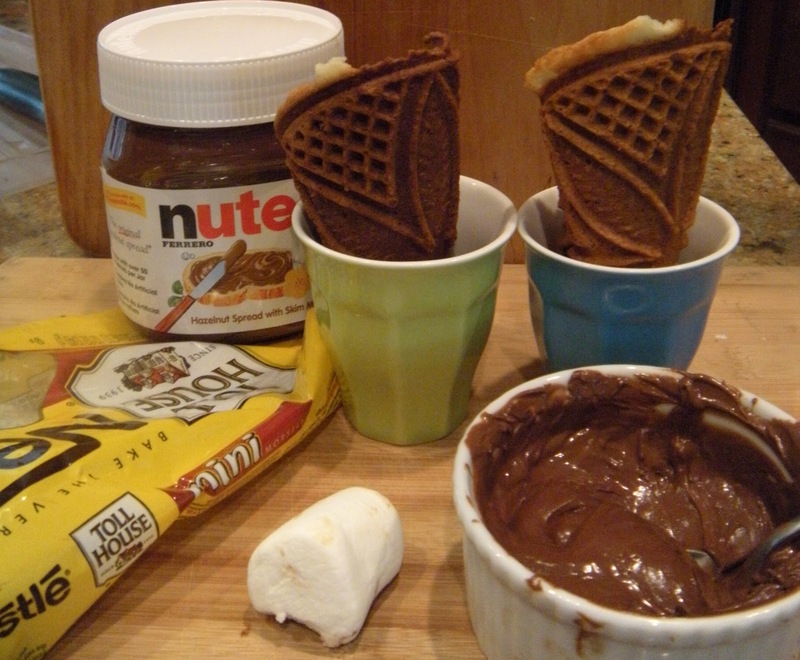 The special surprise is the Nutella/chocolate that you spread inside the cones, around the cone bowls, on your face, off your fingers...you get the idea. It's good! So easy to make it festive with some sprinkles! 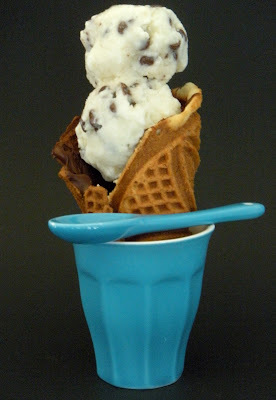 I decided to make home made cones too, with a recipe I found on Martha, I thought it might be a good excuse to get the pizzelle iron out. The batter thins out in the iron...so less is more! 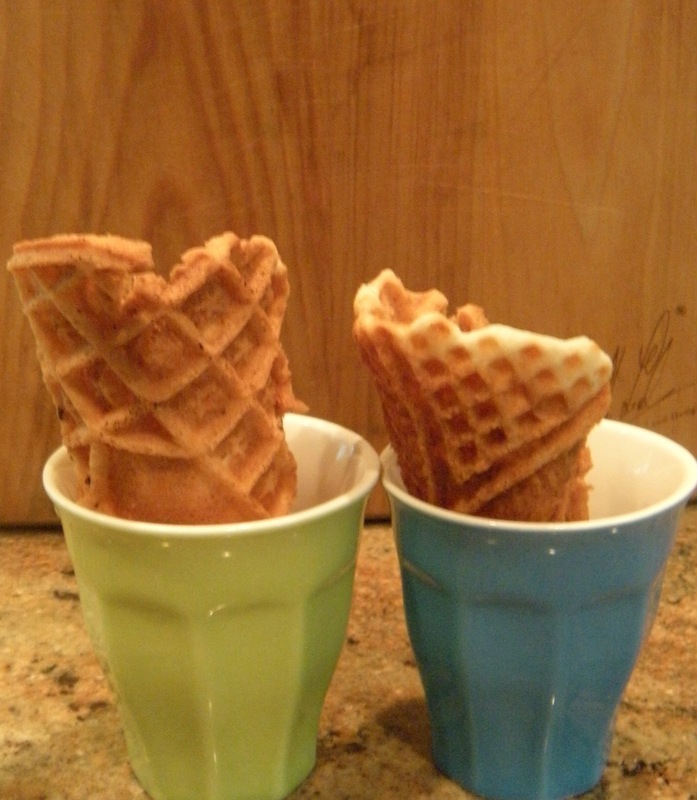 Twist hot pizzelles and cool to make cones. 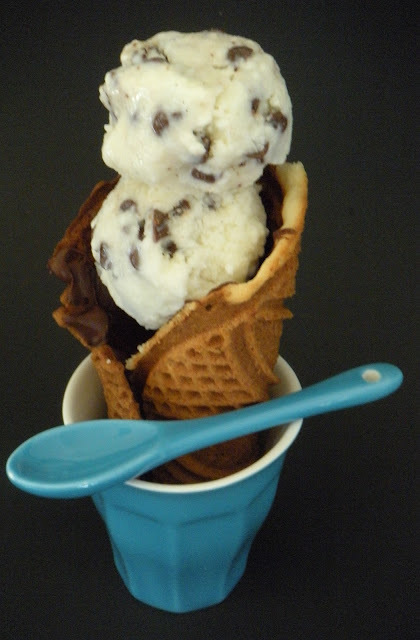 I thought about making a cannoli cone, as I have made cannolis many times, but decided a lighter version was called for! No fried cones! But no matter what cones you use, don't forget the Nutella/chocolate goodness in the bottom! My cones were a little loose, so I tucked a piece of a marshmallow in the bottom to hold the chocolate. Don't be shy here! 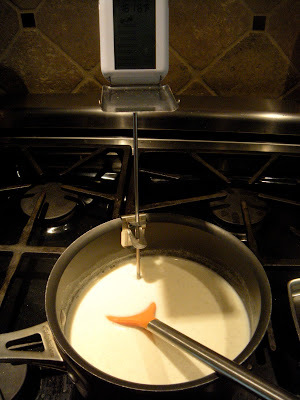 Whisk ricotta and milk in a large bowl until smooth. Add the simple syrup and vanilla and stir in well. Put the mixture into the frozen bowl of an electric ice cream maker (this is a great investment). Freeze according to manufacturer's instructions. Add chocolate chips at the end, I use a rubber spatula to mix them in. Transfer to a clean bowl and freeze until ready to eat. But let it soften a bit before scooping. This will make even non-Italians swoon! Simple Syrup- Combine 1/2 cup water and 1 cup sugar in a small saucepan. Bring to a boil and simmer for 5 minutes until the sugar is dissolved. Cool completely, and chill for best results. Heat pizzelle iron. Beat egg whites until soft peaks form. Add salt, 1 Tablespoon confectioners sugar and vanilla, and beat until stiff peaks form. Fold in remaining confectioners sugar (mine deflated to nothing here, and I anticipated the worst, I was wrong!) and then fold in flour and butter. Drop batter onto greased pizzelle iron and cook until desired doneness. I don't have a cone mold, so I made cones by rolling and placing in a small cup, they were pretty tiny! And I made bowls by slipping the hot pizzelle into a small bowl and letting it cool into the shape. Melt in mico at 30 second intervals. If the cone had a gaping hole at the bottom, I cut a small marshmallow piece to fill it in, then I brush the inside of cones with this mixture and a blob of goodness at the bottom and pop in fridge to firm up. I did the same for the bowls, and some I did the edges with some sprinkles. Either way, the Nutella chocolate thing is delicious, and I made extra. Scoop the ice cream in and serve! That frozen blob at the end of a cone after the ice cream....delicious! The cones and the ice cream were totally amazing! Buon Appetito! So, what are you waiting for? Get in there and cook!